Elegant custom home with almost 5,000 square feet, five bedrooms with five bathrooms, strategically situated on just over one acres. 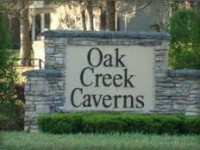 Located on a private and peaceful lot in beautiful Oak Creek Caverns. The community is gated and completely fenced with a guard house. It is located just a few minutes from state road 200 next to Blessed Trinity High School. It is very quiet and very private. Detached garage with apartment upstairs with full bathroom currently used as a man cave. This property does offer whole house solar panels making this home extremely energy efficient with little to no energy consumed from the utility company. Great location in of one of the most sought-after areas of town.